The world is definitely a crazy place. The people living in it are even crazier, mainly because of the weird things they do, if not for how differently they all think with such similar brains. Think about skip bins, for example. While some dump all their rubbish in them, others dig into them. And that’s just the beginning. People do not dump just food and rubbish in skip bins, they do a whole lot more than that. They crazily dispose of all kinds of things into those stained plastic bags without a second thought! You might never have found anything unusual in the skip bin on your street (but then you probably didn’t dig deep enough) but there are people that have come across all kinds of unusual items, some of which have gone on to change their lives. If you are wondering what some of those items could be, we have listed hem for you. A scavenger found a small collection of necklaces in a neighbouring skip bin. There is no certainty on what the beads were made of but the man later revealed that they were quite heavy. One necklace had a 14k gold clasp attached to it while each of the two others had two small bits at the top and a bottom section that was marked as 18k gold. Whatever they were made of, nobody knows. Surprisingly, the man didn’t try to sell the collection. Instead, he gave it to his wife as a wedding gift after eight years of marriage. For the past five years, Dennis has been working for a waste management company. Three years ago, he stopped by a big school in a certain district, only to find that their trash was mainly comprised of boxes that contained a lot of computer equipment. He decided to look through some of it first and realised that most of the equipment was basically crap stuff. After further digging, he came upon 3 huge boxes that contained parts of a 150 IBM Model. The vintage mechanical keyboard turned out to be worth over $100 a piece on eBay, and he ended up making up to $10,000 out of all that scrap. Nowadays, seeing what people throw away is the most interesting part of his job. Max is a security guard at a high-end apartment complex. Last year, he decided to start going through the bins after coming upon a fully functional oven in one of them. Nowadays, he finds more than just ovens. The trash usually includes items such as brand new purses thrown out by tenants and brand name glasses (such as Gucci, Prada, Armani) disposed of after getting tiny scratches on them. Sometimes, the trash contains brand new clothes with their tags still attached while on other days, food that is a month away from expiration is also disposed of. And there’s more. Recently, he came upon a Tag Heuer watch and an iPhone in those same bins! While scavenging, a man found a police evidence bag hanging from an open case. Within the evidence, a bag was a mobile phone, a hundred grams of marijuana and more drug paraphernalia. The man never showed himself to the cops. Instead, he left them the evidence bag with a note outside the local police station. Lisa has a weird hobby of sniffing things. She randomly searches for anything she perceives to smell and makes funny faces out of what she smells. Her classmates then made a deal with her. They agreed that if she could find the source of the smell that had been torturing their nostrils for the previous two days, she could ask for whatever she wanted. The next day, she closely followed the stingy smell that soon led her to the back of their classroom. There, she found a bin that contained a black bag. Out of curiosity, she flung it open, only to discover a putrefied racoon covered with maggots all over. At that point, she lost her consciousness, not because of the smell but due to the sight of the decaying racoon. In Ireland, an old grandfather had a heart attack after his grandson showed him a bomb he’d found in a skip bin. The man was hospitalised for several days after the incident, unaware that the bomb had actually been fake. Nobody knew that a policeman had accidentally thrown the fake bomb into the skip bins during an operation. The man who was responsible for the fake bomb later apologised and paid for the old man’s hospital bill. 4. Random Limbs in Bins and so much more! Andy was not necessarily a garbage man, nevertheless, his job involved removing hazardous waste from a large hospital. One day, he was called and tasked with sifting through the waste bin to find a gall bladder that was urgently needed for cancer testing. He then spent the next three hours or so going through the dumpster and searching for a discarded gallbladder. He finally got to the bottom, but all he found was a two-week-old leg sticking out in a corner of the container. Meanwhile, in South Carolina, a garbage collector on his daily route saw and heard a guy throw away a bag full of puppies straight into the nearby skip bins like they were stale Nachos. Most of them died and the garbage collector was furious at the act. So, he called the cops, and the guy was sent to jail for animal cruelty. The next day, he came across a bag full of cat heads. Outraged, he quit that job altogether. We don’t usually see this on cop shows, but the police hire garbage collectors to go diving through the skip bins just to solve a murder case. They will ask to look for certain types of containers or chemicals and basically anything that can indicate somebody was ‘breaking bad’ out there. If there’s been a robbery, they’ll be asked to look for burglary paraphernalia or even cash registers in the trash. That is because some robbers do take registers home and then just toss them in the garbage, expecting no one to notice. On some occasions, the police take entire loads of trash gone through by the searchers, only to find drugs or worse things like corpse parts. There was a time when a policeman found different body parts dumped around different places in the same town, so the professional dumpster divers were called upon to search all the area skip bins and find the whole body! A Filipino grade school dropout turned garbage collector is living proof that one can make money from trash. Alice is a junk shop owner who makes money every week by just sorting through the garbage. During an interview once, she tearfully recalled her life before. When she was a kid, she sold vegetables in nearby towns. Her parents didn’t want her to study so they forced her to work in spite of her young age. She didn’t even make it to high school; nevertheless, she never stopped dreaming big. At the young age of 11, she started to clean and fix whatever garbage she could find in skip bins along the busy streets of Manila. Then there were those ugly times when she had to dig for food in the trash bin just to put something on her plate. She later met her husband who also collected scraps and they had eight children. After forty-eight years as a junk shop owner, her hard work finally paid off. She now has a three-story “dream” house with nine rooms and earns thousands of pesos each week from the junk shop. She also manages to support each of her 8 kids through college. This only proves that one man’s trash is another man’s fortune. Thanks to all the skip bins she once dealt with. 1. Its “BIN” a Miracle! In December 2012, a newly born baby abandoned inside a skip bin was discovered by a passerby who was alerted by the child’s crying. The baby, who weighed ten pounds, turned out to be a boy. The man immediately took the child to the nearest hospital for treatment. Luckily for both of them, the baby did not have any complications. The man was unemployed at that time and his wife was just a regular teacher in a countryside school. The couple had never had a child of their own and was very happy to keep the baby. After several weeks, the man took custody of the child and named him after Saint Joseph. Considering his humble beginnings, he was indeed a blessing for the couple. There are probably hundreds of crazier things being found in skip bins every hour of the day in every town and city in the world. While most people continue to look at skip bins as waste collection centres, others are finding in them the keys to the better futures they’ve always dreamed of. That’s the irony of the way the world works. 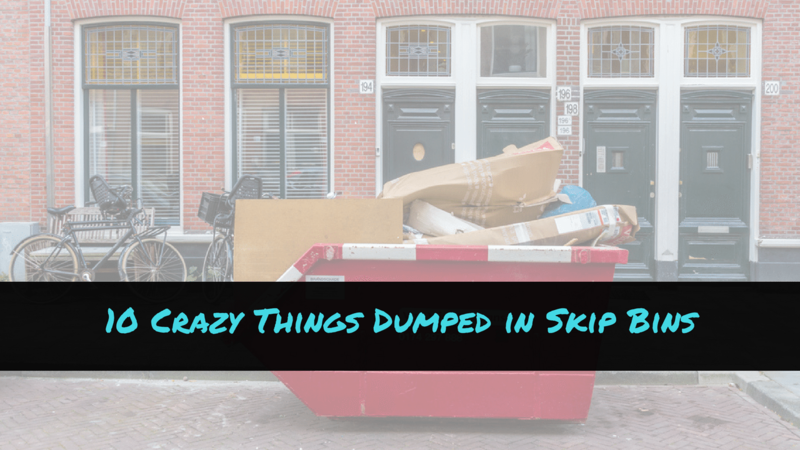 Speaking of crazy, would you dig into a skip bin for anything?